For people in parts of Snowy Mountains Forecast District. Issued at 10:40 am Tuesday, 11 September 2018. A cold front and associated trough will approach the state's west generating a vigorous northwesterly flow. This front is expected to cross the southwest later today, reaching southern coastal parts Wednesday morning before slipping south during the day. 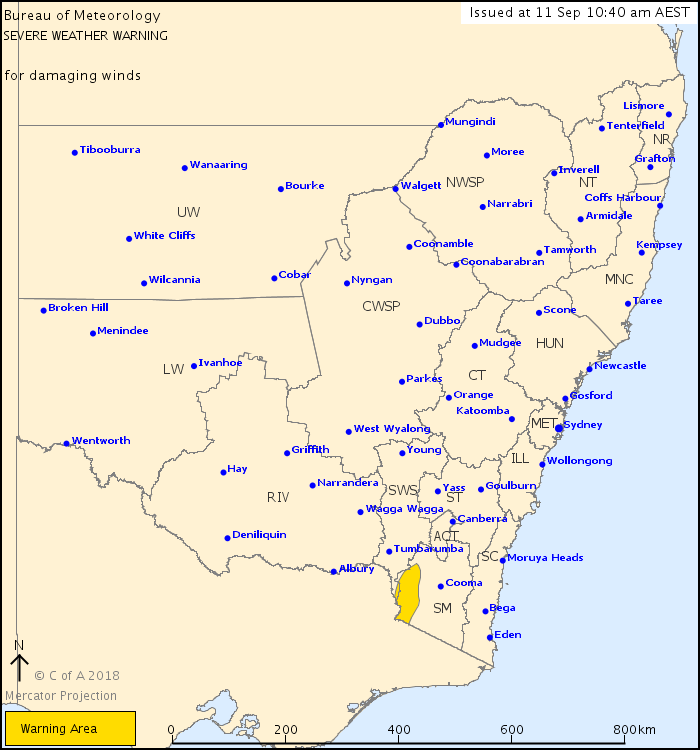 DAMAGING NORTHWESTERLY WINDS, averaging 80 to 90 km/h with peak gusts in excess of 125 km/h are likley for alpine areas above 1900 metres from later this afternon. Winds are expected to ease following the passage of the front during Wednesday morning. Blowing snow or BLIZZARDs are possible for alpine areas above 1800 metres. The National Parks Service of NSW recommends that people consider postponing back country travel until conditions improve. Locations which may be affected include Thredbo Top Station and Charlotte Pass.